What Amazon can do for you? 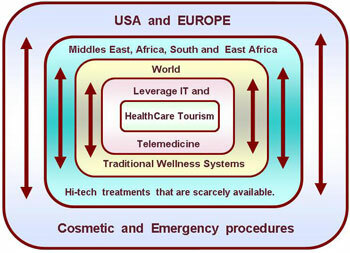 Amazon Health and Medical Tourism Pvt. Ltd. ( AHMTPL)ables us to expand our network and serve the world to expectation. We provide help for offshore medical trip to international patients for their safe health care medical tour travel to India. Our trained health care associates and India health travel managers would be pleased to assist and guide you at the AHMT global patient care centers in the country by receiving, processing and forwarding your health care query & providing information on top rated, accredited specialty private hospitals in India, private clinics in India, medical research and health care institute facilities in India. Also assist in search to find and provide information on specialist Indian medical professional consultants- board certified doctors, board certified surgeons, board certified dentists – dental surgeons and board certified physicians abroad in India, arranging online ask a doctor- free web consults and telephone consultations with best qualified doctor and experienced therapists, assisting on India visit formalities- VISA and providing info on medical surgery treatment fee discounts and the Indian affordable medical health travel tour package cost savings. AHMT has included some of the overseas patient testimonials and patient stories on medical surgery treatment in Indian hospitals and clinics, in the website; you are welcome to read a few foreign patients feed back story- testimonials of visiting patients from abroad. A large percentage of the overseas medically uninsured patients from North America- USA, NHS wait listed patients from UK and Canada, Australia, Europe and other countries do not have financial access to private medical health care and major medical surgery treatment procedures performed at private hospitals and private clinics. AHMT arranges for easy pay back finance options and financing plans for affordable medical surgery treatment procedures abroad in India for the people who are not covered by health Insurance, are underinsured, self pay or self insured. AHMT through established relationships with finest board certified medical professionals- board certified surgeon, board certified doctor, physician and JCI – JCAHO accredited, government registered and approved private medical Healthcare facilities in India, caters to cost sensitive overseas patients care in helping international patients receive world-class medical surgery treatments at considerably lower costs and in almost no waiting periods. AHMT takes care to provide the best of concierge services for the patients traveling abroad for their medical surgery treatments to ensure world-class facilitation services for a safe and comfortable medical tour vacations travel to India. AHMT provides world-class low price facilitation services for the visiting overseas patients from abroad for their cheaper surgery treatment trip at the top rated private specialty hospital and clinical facilities in the following Indian cities - New Delhi, Mumbai - Bombay, Chennai - Madras, Bangalore, Hyderabad, Thiruvanthapuram - Trivandrum, Cochin, Pune, Kochi - Kerala, Kolkata - Calcutta, Mohali - Chandigarh, Ahmedabad, Amritsar, Coimbatore, Gurgaon, Noida , Goa & Jaipur.